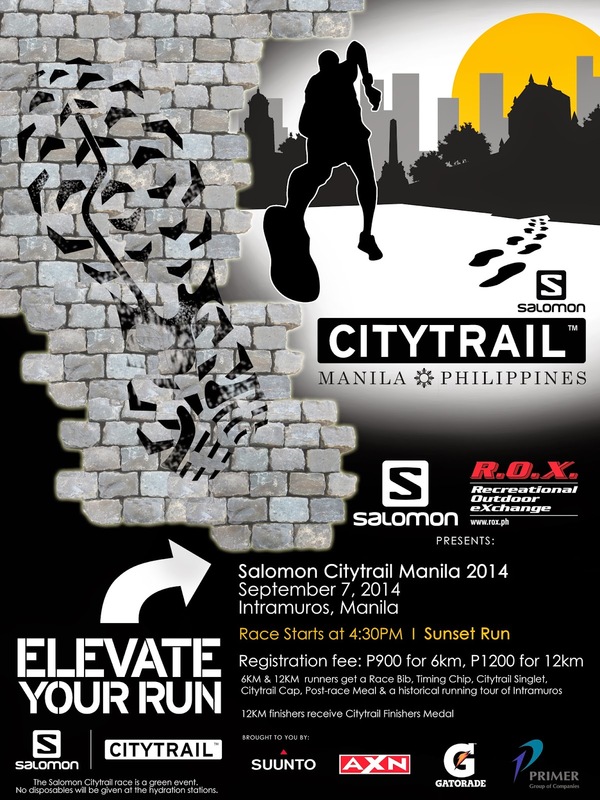 After much deliberation, the Salomon Citytrail Manila is set to launch on September 7, 2014 at Intramuros, Manila. The oldest city in the Philippines, The Walled City was deemed perfect for an adventure run that will not only be challenging and exciting with its dynamic urban landscape, but rich with culture and heritage as well. Even more enticing is the fact that the race starts at 4PM, which means the runners will experience all these amid the Manila sunset –the best time to explore and absorb the old fortress. The sunset run is set to target at least 500 participants made up of adventure seekers, road runners, weekend warriors, fitness buffs, and trail running enthusiasts. Divided into two categories of 12km and 6km, the course will not be a conventional road run and will include challenges such as climbing stairs, crossing bridges, and clambering ramps around the Walled City. Foot strikes on different surfaces, ascends on bridges and stairs will stimulate trail running skills while rediscovering Philippine heritage and culture. Salomon brand ambassadors, Philippine Sky Runners & Suunto Athletes will be the assigned to selected areas to marshal and guide the participants in the running tour. The cutoff time for the whole race is two hours. The registration will be open from August 1 to August 29 at the Salomon stores and August 30 to September 5 at R.O.X. Bonifacio High Street. Participants may also register online ( http://www.runnersrunner.com/2014sctp/). The fee is P900 and P1,200 respectively for the 6km and 12km categories. All registrants will get a race bib, timing chip, Salomon Citytrail singlet, Citytrail cap, post race meal and a historical running tour of Intramuros City. 12km finishers will get a Citytrail Finisher’s medal. Top three male and female winners per distance will be awarded with R.O.X. gift certificates, Salomon products, and other freebies. Salomon items and products from sponsors will also be given away to lucky participants on the day of the event. Fortunately, participants need not to worry because substantial parking spaces will be made available within the venue. Plus, a baggage counter will be situated within the Start/Finish area in Fort Santiago where race participants may leave their belongings. Salomon Citytrail Manila is a green run as it promotes sustainability and environmental preservation. No disposables will be given throughout the race course. Gatorade dispensers and water jugs will be stationed around the road areas of Intramuros City. In line with Salomon’s campaign to “Elevate Your Run”, it is through the Citytrail event and its latest Citytrail footwear that Salomon aspires to introduce Citytrail running as an urban alternative to trail running. A global event meant to entice everyone to “Elevate Your Run”, Citytrail running is all about being creative and imaginative when it comes to making your own trails in the city. It involves making use of the different surfaces within the city like pathways, roads, sidewalks, alleyways, bridges, stairs, et cetera to keep the experience exciting and more challenging. Living up to its claim as the leading expert in trail running equipment, Salomon will also be launching the X-Scream, the best choice for Multi-Terrain Urban Running. Dynamic and cushioned, the X-Scream is an agile Citytrail shoe that injects mountain spirit into running in an urban landscape. Designed for an adaptive fit, dynamic cushioning, and grip, the X-Scream features a specific set of innovative technologies including a Lace pocket to provide easy storage for the Quick Fit lacing system; Quicklace, for a minimalistic and strong lace for one-pull tightening; OS Tendon for a perfect ride; Light Weight Muscle Traction; Friction Free Lace Eyelet; Contagrip HA; Molded EVA; Sensiflex, for a combination of foothold and freedom; Contagrip LT for grip and durability; EVA shaped Footbed; Sensifit; and a Non-marking Contagrip. Running and staying fit need not be boring. Through its innovative products and engaging events such as the upcoming Salomon Citytrail Manila event, Salomon calls out to everyone to elevate their run and mix things up by exploring new and challenging trails. Salomon is exclusively distributed by the Primer Group of Companies, Asia's next retail giant.